A young woman in Bangalore, India puts the finishing touches to a rangoli, a colored powder decoration, to celebrate Diwali at her home. Diwali begins today, 19 October. Issues of light and darkness, evil and goodness are prevalent in all the great religions of the world. These are concerns that everyone grapples with in life — and we are reminded of this once again today, as Hindus begin the festival of Diwali, the Festival of Lights. There are many different spellings of the word and many variations of the festival in different places in India and elsewhere. In southern India, where CNEWA works with the Syro-Malabar and Syro-Malankara Churches, Diwali is celebrated by our Hindu neighbors. As is the case with some holidays in Judaism, Christianity and Islam, the date of Diwali depends upon the moon. It is a five-day festival which begins with the new moon between the Hindu months of Asvin and Kartika, which translates into sometime between the middle of October and middle of November on the Gregorian calendar. This year Diwali begins on 19 October. Diwali celebrates the victory of the god Rama. His story is found in the epic poem Ramayana, which is well over two thousand years old and contains over 240,000 verses, making it one of the longest poems in the world. In it Rama with his wife Sita and half-brother Lakshmana is exiled from his kingdom. While in exile in the forest, Rama’s wife, Sita, is kidnapped by the demon king Ravana. A battle ensues, Rama is victorious and all return in glory to Ayodha, where Rama is king. Diwali is a joyful and extravagant feast, with an emphasis on sweet foods, exchanging of gifts and decorating of houses. Since it is the festival of lights, lamps, fireworks and wonderful decorations called rangoli abound. Each area and even each family will have its own tradition of how the rangoli is designed. It is a complicated piece of art composed of colorful symbols and complicated patterns. It is often surrounded by burning lamps. In some places floating candles are launched onto lakes and rivers or colorful paper lanterns released into the sky by the thousands. During Diwali prayer and services (pujas) are offered. Some Hindus direct special prayers to Lashsimi, who is the goddess of wealth and prosperity, and to Lord Ganesha, the elephant deity, who is the remover of obstacles. As the world becomes smaller and religions must learn to interact with respect and peace, it was good to hear that in southern India Christians send Diwali cards and greetings to their Hindu neighbors. Even in some parts of the U.S. and Canada, Diwali is becoming a festival that is familiar to non-Hindus. Read the Vatican’s message for Diwali 2017 here. Franciscans serving in the Holy Land have had an impact on Christian pilgrims, said Franciscan Rev. Michael Perry, minister general of the order. “The Franciscans’ care for pilgrims, their attention to detail, their efforts to demonstrate the love of God, the mercy of God through different religious services and ... how they welcome people in hospitality houses, these become elements that people themselves, Christians and others, take back to (their) countries,” said Father Perry. He said he witnessed one of the strongest examples of the Franciscan dedication both to the local Christians and to the holy sites in Syria, which he visited in April. There, two Franciscan friars remained with 300 Christian families in two villages under the rule of the Islamic State group in order to “guarantee Christ’s presence ... and the presence of Eucharist and a presence of church” for the families, he said. “The Franciscans really serve as a cornerstone for coordinating and implementation and getting the funding in ... and also empowering laity to become partners in caring for their own people in Syria, so the laity in Syria, the young people in particular, were involved in this dire service to their own people, and not just to Christians, but to Muslims as well. This was an amazing witness to me,” he said. In this image from January, the pope’s envoy to Syria, Cardinal Mario Zenari, shakes hands with Muslim religious leaders during a visit to the Great Mosque of Aleppo. “Although some politicians still hope to use this conflict for their own power interests, pressure for reconciliation is spreading up from below among the people who’ve had enough of it. This is a positive change, and it brings a real chance of peace,” he told Catholic News Service 18 October. Ukraine’s armed forces have been substantially rebuilt with $857 million in “non-lethal” Western military aid. Gen. Viktor Muzhenko, chief of the military’s general staff, predicted in mid-October he could recapture Donetsk and Luhansk from the separatists with defensive weaponry requested from the U.S., but only at a heavy cost in lives. “Ukraine cannot stand alone. It needs support, and we’re grateful to people of goodwill in Europe and the U.S. who are engaging and showing solidarity with us,” the bishop said. 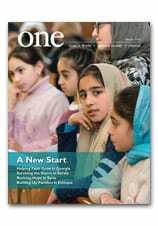 Dale Gavlak visited villages in Jordan for the current edition of ONE, and here offers some further impressions of a people working to preserve an ancient way of life. I first met The Rev. Boulos Baqa’in in the CNEWA office in the Jordanian capital, Amman. Dressed in his black clerical shirt and white collar, the immense energy Father Boulos exudes is directed into confronting the crisis in his rural home area of Karak, south of the capital. Youth are leaving in droves due to little or no employment opportunities. The area is the historical heartland of Jordan’s Christian Bedouin tribes, boasting the country’s last two remaining entirely Christian villages of Smakieh and Hmoud. But with the flight of youth to Amman or further afield to the Arab Gulf and their parents aging, there is serious concern for the future of the area’s Christian heritage. These villages have also supplied the bulk of Latin and Melkite Catholic priests, as well as Orthodox priests and religious for Jordan, Israel and the Palestinian Territories. That’s why Father Boulos is meeting with Ra’ed Bahou, CNEWA’s regional director for Jordan, who is encouraging him to enter uncharted territory. They’ve devised a plan to set up a powerful Internet connection between the CNEWA community center in Amman and one initially established at the Ader Greek Melkite Church to provide long-distance training of practical skills, such as IT by professionals. Relevant teaching on pertinent health, education and cultural issues will also be provided to the villagers in a bid to educate the youth and older people alike. The hope is that the venture might also encourage telecommuting job opportunities with new found IT and other skills. “Fresh ideas and thinking are wonderful for the old. We also hope to make skills for the youth and allow job prospects to take root in the villages,” Father Boulos says. Father Boulos and his wife have their own bittersweet experience of the problem endured by many of the older residents in Kerak and the surrounding villages.